Comprehensive Altair Solar Wedge instructions (opens new window). 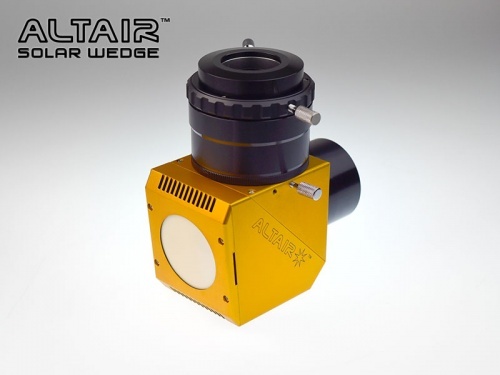 Safe and easy to use: Unlike cheaper solar wedges which overheat or worse, direct excess energy downwards into the ground, the Altair Imaging-Ready Solar Wedge directs energy into a special extra thick Polycrystalline Ceramic diffuzer disc at the back of the Wedge. Air vents allow air circulation by convection. The Polycrystalline disc has the added benefit of acting like a "solar finder". The sun appears as a "ball of light" on the back of the disc - simply move your telescope until the ball of light is in the centre of the disc, and you are aligned with the sun! Read the Altair Solar Wedge instructions here (opens new window). Here's a 500 frame image of a sunspot group imaged with Altair Solar Wedge by Nick (Altair) during 3rd round of prototype testing on 07-18-2016 @ 12:29:22. Camera - Altair Hypercam IMX174, Altair Flat Field Barlow, with a prototype 125mm ED refractor. 500 frames stacked in Autostakkert, and processed in Registax. 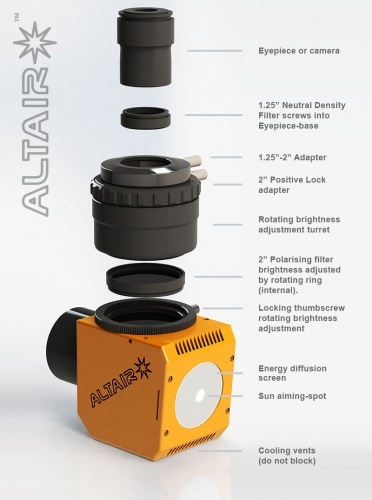 Q: Will the Altair Solar Wedge come to focus with my refractor telescope? 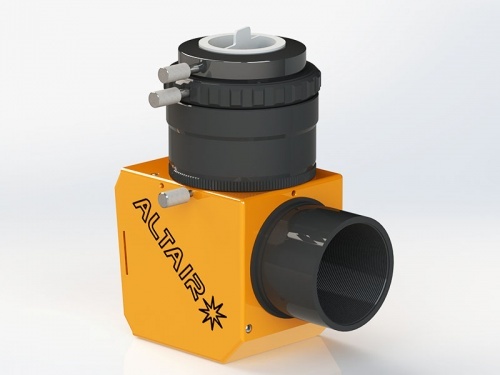 A:The Altair Solar Wedge has an optical path length (also known as "backfocus" of 115mm from the front telescope facing side (excluding the 2" barrel) to the top of the 2" turret where the eyepiece or camera is inserted. This is similar to most 2" mirror diagonals, and shorter than most other solar wedges to maximise compatibility. Q: Can I used coloured filters like solar continuum filters with the Altair Solar Wedge? A: Yes you can but only if added AFTER the wedge. NEVER add ANY filter in front of a Solar Wedge (..e. between wedge and telescope) because it will crack or melt due to the concentrated heat from the sun, damaging the inside of your telescope. Q: How do I "tune" the image brightness for imaging? A: When imaging the sun using "lucky" imaging techniques with a high frame rate camera like the Altair Hypercam, it's best to keep the exposure duration of the camera as short as possible - ideally under 10 milliseconds is ideal, though less than 5ms is even better. This "freezes" air motion to show granulation and other small details. Being designed for visual or imaging use, the internal polariser module (controlled by rotating the turret top) has a wider brightness range than normal Hershel wedges allowing fast frame rates and short exposure duration. When set for fast frame rates, the image can appear very bright visually through an eyepiece - like looking at a light bulb. This is uncomfortable, but not dangerous due to the protective ND filter inside the unit allowing 0.1% of light through. Therefore, an additional 1.25" neutral density filter is provided, which transmits 75% of light, blocking 25% for initial focusing and setup with an eyepiece. When you first set up the Wedge and align it with the sun for visual use, you should add the provided 1.25" Neutral Density filter to the eyepiece, then rotate the turret-top until the image is quite dim. Once you are satisfied with the balance of contrast and sharpness, lock the polariser locking thumbscrew, and you are ready to observe. If using the wedge for imaging only, you can just insert the camera and turn the turret-top until you are satisfied with the exposure duration and gain settings. Q: For how long can you keep the wedge aimed at the sun? A: The Altair Solar Wedge has been fully tested with the sun remaining in the centre of the field of view for 5 hours of continual exposure with a 6" (152mm) aperture refractor in mid-summer in the UK. At no point did the outer prism housing become too hot to touch, a problem common with other wedges. Whilst we cannot recommend use with telescopes of larger than 6” (152mm) aperture for longer or shorter duration, if your telescope is larger, then we suggest trying the wedge for a short time initially, to assess the heat build-up and make your own informed decision.